Yup, it's been a month. I suppose I should just get used to the idea of time whizzing by. In some ways I'm grateful for it. I have to say that I'm rather eagerly looking forward to the second half of this year so the fact that we're practically into April doesn't really scare me so much as delights me. Still. I'm not getting as much done and feel rather stressed about it! Meet First Born Me! I will always want to be getting more done - and faster! Anyway, checking in on my goals last month, I accomplished almost everything I wanted to read for 5 Minutes for Books. I read In The Shadow of the Sun King. I also completed reading Multiple Bles8ings and shocked people by not having ever heard of the show. I didn't, however, get around to reading Octavian Nothing. That's still on my list. As for my personal reading, well, let's not even go there. 1. Around the World in Eighty Days (as part of the Classics Bookclub). I also promised to participate in a Podcast about this so you all might hear my voice soon. Yeah.Ok.Moving on. And what about you all? I so look forward to What's On Your Nightstand and I know that so many of the rest of you do also. 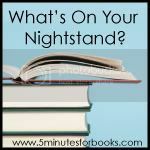 I look forward to seeing what is on your nightstands! See you around! Wow, your church book club reads a ton! Good list! On your recommendation, I'm about 100 pages into 'The Mysterious Benedict Society'... and think it's FABULOUS. Tell me more about your church book club. That sounds like an interesting and fun idea! Great stack of books. I want to read Lawhead's trilogy too. Finished Around the World! I've been looking at Lawhead's trilogy. I like some of his stuff and find some of it a bit too off for my taste. I look forward to hearing what you think of Hood. I enjoyed Emily of New Moon last week and look forward to more time with her. Thanks for encouraging me to look at more Montgomery beyond Anne. And I hear you about how time seems to have flown between these Nightstand Tuesdays! Okay...how did I miss the review of Hood? Oh, I know...life is crazy. But I just finished it, and it is wonderful! I called every used book store in the area yesterday looking for Scarlet with no luck, so I had to get it from the library. It's on the list for April. Looking forward to hearing the podcast! I read Hood last year and enjoyed it. For some reason I couldn't get into Scarlet so much. Will have to attempt it again. Totally forgot about it. Oh I look forward to reading about the C.S. Lewis book! I'm sorry I missed the L.M. Montgomery challenge. I've been slowly reading through her books, too. Just finished Magic for Marigold. Thanks for sharing the Thomas a'Kempis quote. I like that one! I've heard of The King Raven Trilogy from a few different places. I might have to check that one out! I'll definitely be linking up my review of Hood to the I Read It carnival next week. I've never had anything to post for that one before, so I'm glad I'll get to participate! I feel so envious of all these great book lists that I keep seeing, particularly since I'm hitting exactly that point in the year where I really won't have time to read for a while. Ah, well. I'll certainly enjoy seeing your reviews of these books. 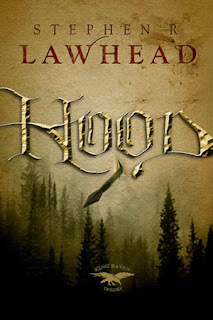 I haven't read anything by Stephen Lawhead in years; I should pick up Hood. I'm just now catching up with the WOYN posts and am actually doing a giveaway as part of mine!